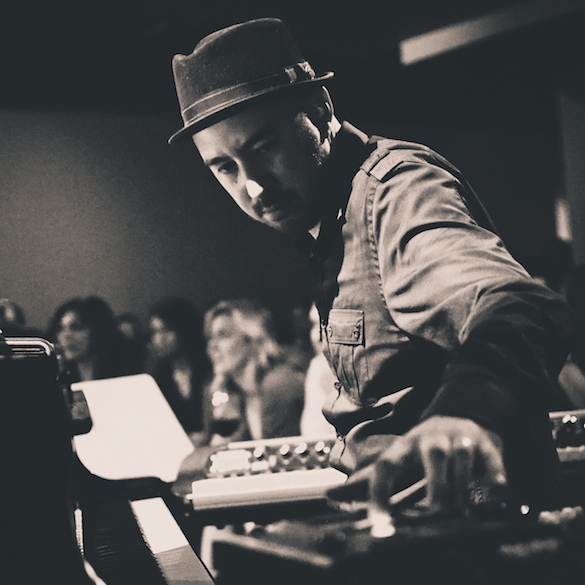 Originally from New Zealand & currently residing in Los Angeles, DJ/producer and keyboardist Mark de Clive-Lowe has long been at the forefront of the nu-jazz scene, blending jazz and ethnic music with urban grooves, house, breakbeat, drum ‘n’ bass, and hip hop. What really sets Marc apart is that his original music and remixes often center around jazz played with real instruments, so his sound is more live than many of his contemporaries. He’s had a plethora of releases & remixes on highly respectable labels & championed by such heavyweight DJs as Jazzanova and Gilles Peterson. With the release of his new ‘Church’ Album, Marc gives a track by track insight into how the cuts came to life. Mark de Clive-Lowe’s ‘Church’ Album is out now on Traxsource. 01 The Mission featuring John Robinson. 02 Nova Roda featuring Contramestre Xingu	(pronounced “Shingu”). This is one for the uptempo DJs with plenty of club bounce. Rhythmically a nod to my decade spend in the thick of the West London broken beat scene – alongside the likes of 4Hero, Bugz in the Attic, Domu and the like, ‘Brukstep’ is about bringing that UK two-step groove into the jazz vibe. It gives me a chance to stretch out on the grand piano, and Duane Eubanks plays a blazing trumpet solo. As on all of the album, I did almost all of the electronic manipulations, drum programming, sampling and effects live in studio as we performed all together. That’s an important part of the vibe to me – that the electronic elements are as spontaneous and organic as the acoustic ones. Featuring some of my favorite LA musicians, ‘The Processional’ is an homage to some of the greats that came before me. Specifically – Alice Coltrane, Joe Henderson, McCoy Tyner and J Dilla. In some senses it’s a concept piece, consciously holding those inspirations in mind. Low Leaf guests on harp and brings that Alice Coltrane undercurrent to the whole piece while Miguel Atwood-Ferguson on viola and Josiel Perez Hernandez on trumpet take the role of the horns. It’s a mood-setting entrance piece with a definite head nod factor with the synth bass and beats anchoring the whole thing. 05 Now or Never featuring Nia Andrews. This is a song that Nia Andrews has been performing with me at CHURCH since we started the original LA clubnite over 3 years ago, but never recorded an official studio version. The musical vibe of the track was originally inspired when I was listening to a Max Roach record – I loved taking that inspiration and finding my own way to explore it musically. Nia (pronounced ‘Nee-a’) has been resident vocalist alongside me since the clubnite started and was in fact the person who christened the event ‘CHURCH’ in the very beginning! She’s an amazing songwriter and calls this song “a love letter to her wildest dreams”. The Ghaziya (also Arabic for ‘conqueror’) was an Egyptian dancer of the Nawari people banned in the 19th century and whose style later evolved into western forms of belly dance. This composition was always an exotic and mystical sounding melody built on a dancefloor sensibility. The name seems to really embody the intention of the composition. As with many of the instrumental tracks on the album, musically it’s about transposing the traditional idea of a jazz quintet to a contemporary setting, exploring the textures and styles that electronics can bring to the music while keeping the soulfulness, spirit and FUN of what we’re playing! I wrote this composition when I was on tour in South Africa, sitting in my hotel room in Johannesburg one day. Thinking of my good friend and collaborator, viola master Miguel Atwood-Ferguson, I wanted to compose something that I could imagine his musical voice on. As with most of my compositions, it had a working title – ‘Sketch for Miguel’, and once we started playing it live and then took it to the recording studio, it seemed that the name really said it all. Along with Jamire Williams on drums and Ben Shepherd on bass, this is a fun play around the musical ideas I wanted to explore. 08 Hollow featuring Nia Andrews. Once again featuring Nia Andrews’ soul-seeking songwriting and vocals, ‘Hollow’ tells the story of loss of faith, and loss of belief. It’s a feeling of hopeless emptiness that we can all probably relate to on some level – while in the meantime the musical composition meets the pain with a sense of hope and renewal… After Nia’s final words, I live-sample all of us playing and flip that into the outro beat, remixing the composition on the fly. 11 Sun Up Sun Down featuring theeKIDICARUS. ‘Sun Up Sun Down’ was inspired firstly by an Art Blakey record I had on randomly one day, and also by music by the likes of Branford Marsalis, Ornette Coleman and Thelonious Monk – I wanted to transport that classic jazz vibe into a whole new time. The jazz quintet shot into outer space. With a fun, bouncing vocal guest spot from Pharrell/Chad Hugo collaborator theeKIDICARUS and burning saxophone solo from NYC/Trinidadian Tivon Pennicott, it’s my idea of dancefloor jazz from some other planet. The second of the album’s two covers, ‘Mason’s Galaxy’ was originally recorded on a 1973 Charles Earland album ‘Leaving this Planet’ with drummer Harvey Mason (who the composition is named after) and others. I’ve always loved this tune – it’s so moody and weird, and something I had long wanted to record my own version of. This seemed the right time, and once trombonist Robin Eubanks (Sun Ra, Stevie Wonder, Steve Coleman) agreed to guest on it, it was a done deal. 13 Distractions featuring Nia Andrews. Mark de Clive-Lowe’s follow page & releases on Traxsource.